Janel started weaving March 2017 when she wanted to let go of some of her performance clothing and fabric. She is now accepting commissions for personalized pieces. Wedding, toile, satin, faux pearls, cotton string. 40" x 64"
Alice, vintage dresses, velvet, sequins, embroidery floss, cotton string, nylon. 41" x 69"
Schiele's Portrait with Physalis, velvet, jeans, satin, nylon. 31" x 81"
Flowers, vintage dress, lace, socks, toile, cotton string, nylon. 48" x 79"
Study in Black, 80's vintage dress, jewelry vintage, plastic, nylon, cotton string. 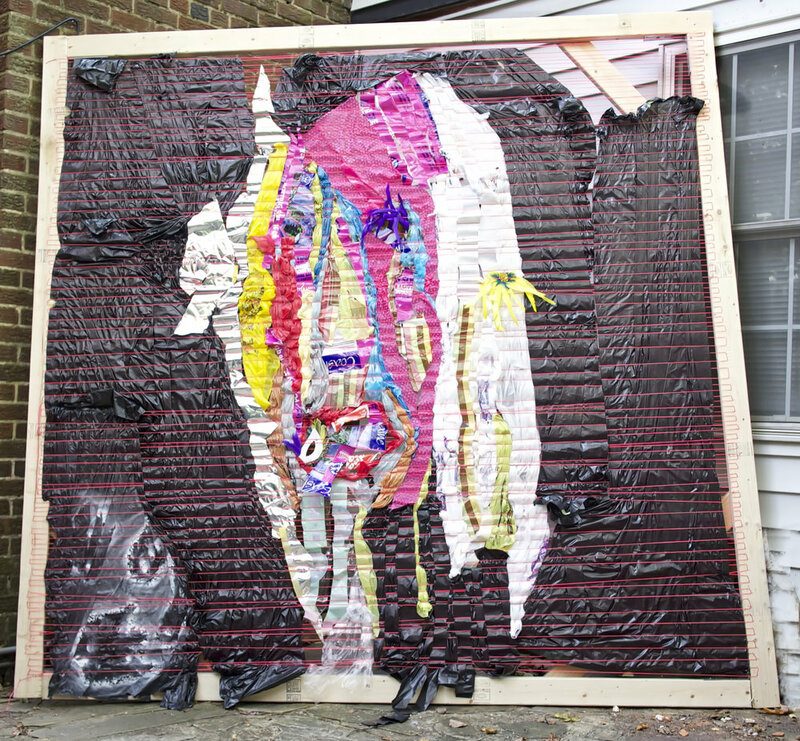 59" x 37"
Woman, trash, plastic, feathers, nylon string. 96" x 96"
Whales, toile, yarn, satin, cotton, cotton string. 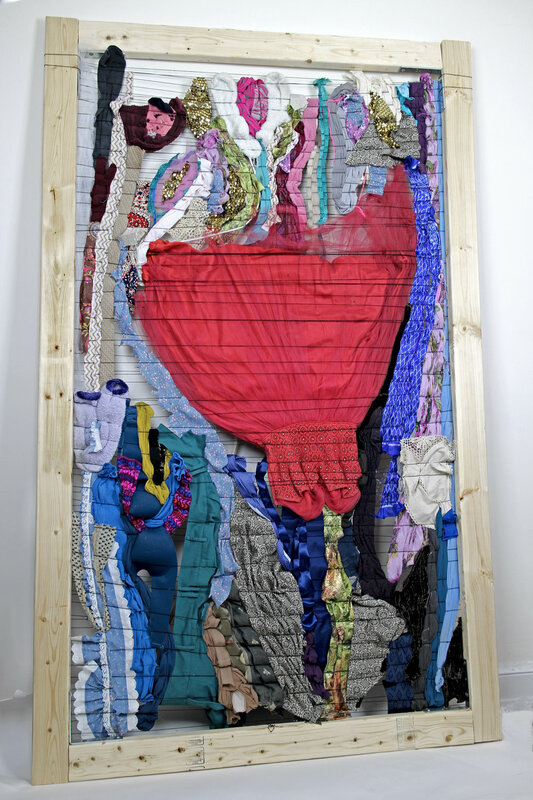 66" x 39"
Curandera, for Susan Alcorn, plastic, yarn, cotton, nylon string, vintage dresses, packaging materials. 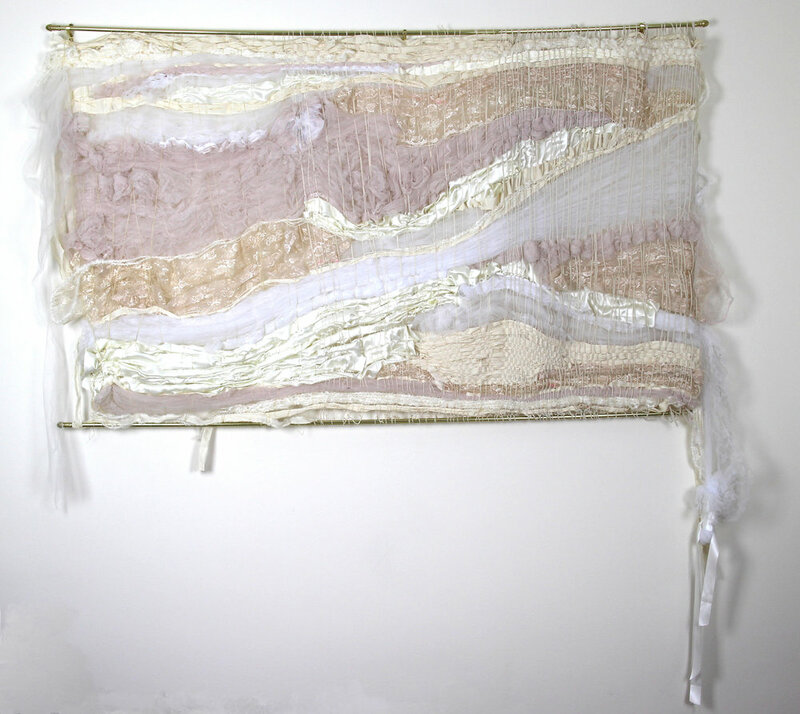 96" x 96"
Big Sur, Cotton, Nylon, Satin, Silk, Gold Sequins. 51" x 44.5"
Gallery 10' x 10' in storage until my next show! Tights, yarn, nylon, nylon string. 60" x 39"
9:30, vintage Japanese robe, nylon, toile, cotton, nylon string. 66" x 39"
My first exhibit was on December 1st, 2017 at the 9:30 Club. I performed my music with my piece 9:30 onstage. While my band accompanied me (Anthony Pirog, Joe Lally, Aria Aquino) I cut the vintage Japanese robe I was wearing and wove it into the piece. We raised money for local non-profit Casa Ruby and raffled the piece off to a winner in the audience. Poster art by Jess Scott.